A man was rescued after dangling off the side of the Verrazzano Bridge. Rana Novini reports. A man’s life was saved Sunday thanks to the help of some quick-thinking first-responders and good Samaritans. New York State Police say a man tried to jump over a barrier on the Verrazzano-Narrows Bridge and into the water. But when Trooper Joshua Kaye spotted a car stopped in the right lane he stopped to take a look. Police say Kaye ran over to the man and held onto him. Two passersby joined in on the rescue and grabbed the man until the NYPD arrived to help pull the man back to safety. Dramatic video (above) shows the tense moments during the rescue. 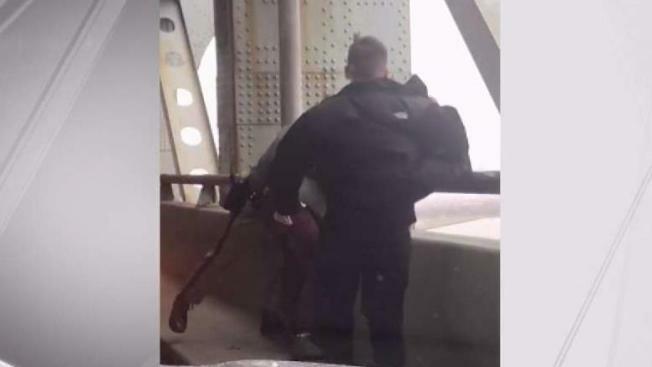 A good Samaritan and police officers helped save a man who was trying to jump off the Verrazzano-Narrows Bridge. The man who tried to jump from the bridge was taken to an area hospital for evaluation. Kaye was also taken to a hospital to for pain to his ribs and back.